Muslims weddings reflect the rich and ancient culture, consisting of several ceremonies that are observed over the course of some days. Both the families & friends of the bride and the groom actively participate in the affair, which is held lavishly in every aspect whether it is the food, decor, functions or anything else. Dowry Agreement : The agreement of the Meher, which the groom has to give to his future wife, is one of the first things to be done as part of Muslim Matrimony. The bride's family is supposed to decide the amount of the Meher, which is meant to secure the future of the wife. Henna Ceremony : Some of the ceremonies after the Dowry Agreement differ from one country to the other. 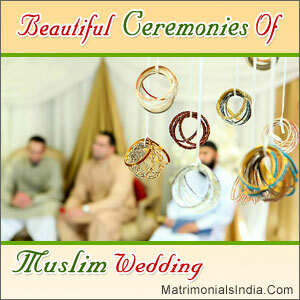 The next ceremony to take place is the Henna ceremony and it is not described in Quran. It takes place usually in the evening and 1 or 2 days before the wedding. At first, the bride is given a purifying bath, called Hammam. After this, the bride is bathed in perfumed water and henna is applied on her feet and hands. The ceremony is not only meant for beautification but has a deeper meaning. It is supposed to bring good omen and is accompanied with dancing and singing by members of the family. Wedding Celebrations : Muslim weddings are usually held at the bride's home or at the mosque and are accomplished by a Muslim religious official. The ceremony starts with the recitation of short speech in the Arabic language and verses from Quran are also recited in Arabic. Then the groom is asked by the religious official if he agrees to take the girl as his wife and the same approval is sought from the girl in the presence of several witnesses while the dowry amount is recalled. Then they receive the marriage certificate. A warm welcome is given after this by the family as part of the reception ceremony called the "Walimah". Here the couple along with family and friend partakes of a grand feast and this marks the end of the ceremonies.